Die Cut Foam - Foam Die Cutting Services | Foamcraft USA, LLC. Foamcraft USA offers foam die cutting services for your unique application. Die cutting is the technique of stamping foam parts using steel ruled tools or “dies” on a machine called a punch press. Any two dimensional shape can be configured and cut on several types of punch presses. 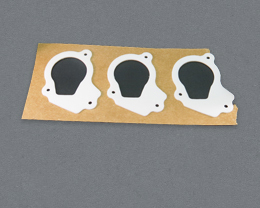 For example, we use the die cutting process to create foam end caps, or protective foam packaging pieces. Clicker presses are smaller and click very frequently. Hydraulic presses cut more slowly but over a greater surface area. Rotary die cutting machines use cylindrical dies to allow parts to get cut and propelled out at an extremely fast rate. Many of our punch presses allow us to kiss cut, a technology for when pressure-sensitive adhesives are used, and allows finished parts to be lifted off the release liner, automatically exposing the adhesive. Our largest press uses a traveling head technology that allows us to use full sheets of raw materials (both open and closed cell), thus eliminating preparatory steps saving time and money. We pride ourselves on our vast array of machinery and nowhere is that more evident than in our die cutting department. Find out why we are the die cutting experts and get a quote today!